Berlin is the capital city and one of the sixteen states of the Federal Republic of Germany. It is the heart of the Berlin-Brandenburg metropolitan region, located in northeastern Germany. With a population of 3.4 million in its city limits, Berlin is the country's largest city, and the second most populous city in the European Union, and fifth in all of Europe after Moscow, Istanbul, London, and St. Petersburg. The Berlin metropolitan area is the fifth largest in the EU with a population of 4.9 million people from over 180 nations. First documented in the 13th century, Berlin was successively the capital of the Kingdom of Prussia (1701-1918), the German Empire (1871-1918), the Weimar Republic (1919-1933) and the Third Reich (1933-1945). After World War II, the city was divided; East Berlin became the capital of the GDR (East Germany), while West Berlin became an enclave surrounded by the Berlin Wall from 1961-1989. Following the reunification of Germany in 1990, the city regained its status as the capital of all Germany. Berlin is a major center in European politics, culture, media, and science. It serves as a continental hub for air and rail transport. The city's economy is primarily based on the service sector, encompassing a diverse range of creative industries, media corporations, environmental services, congress and convention venues. Berlin is the third most-visited tourist destination in the EU. Other industries include traffic engineering, optoelectronics, IT, vehicle manufacturing, health care, biomedical engineering, and biotechnology. The metropolis is home to world-renowned universities, research institutes, sporting events, orchestras, museums and personalities. Berlin's urban landscape and historical legacy has made it a popular setting for international film productions. Recognized for its festivals, contemporary architecture, nightlife and avant-garde arts, Berlin has evolved into a focal point for individuals attracted by liberal lifestyle, modern spirit and low cost of living. Berlin has no definite centre, and attractions are disseminated all over the city. Berlin is varied and diverse. Monuments of Prussian grandeur rub shoulders with buildings that are reminders of a divided country and with impressive new architectural developments. 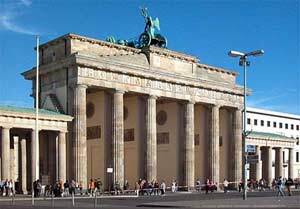 Most sights are east of the Brandenburg Gate, on either side of Unter den Linden. In West Berlin's centre, where there is less to see, take a look at the exception of the broken shard of a church, the Kaiser Wilhelm Ged?chtniskirche, a reminder of World War II. Top attractions are Alexanderplatz, the Sony Center, Berlin Cathedral, Bode Museum, Brandenburg Gate, Charlottenburg Palace, Dorotheenstadt Cemetery, East-Side-Gallery, Federal Chancellery, Gendarmenmarkt, Hackesche H?fe, KaDeWe, New Synagogue, Olympic Grounds, Radio Tower, Television Tower. Mitte, Prenzlauer Berg & Friedrichshain Most sights are in and around Mitte (which in German means centre). The east?west axis of Unter den Linden is a good place to start. Frequent buses (number 100 and 200) run the length of the tree-lined boulevard, linking it with Bahnhof Zoo in the west. The western end is marked by the Brandenburg Gate, the symbol of Berlin, which leads to the enormous Tiergarten Park. Since 1961, the Wall blocked access to the Brandenburg Gate, and by closing the Gate it divided East and West Berlin. North-west of the Gate is the new government quarter and the refurbished Reichstag, topped by Norman Foster's stunning glass cupola (Platz der Republik, 2273 2152). Trips to the top are free, and the view is something to write home about, but expect to queue. South of Unter den Linden is the attractive Gendarmenmarkt square, topped and tailed by the German Cathedral (Deutscher Dom, 2273 0431) and the French Cathedral (Franz?sischer Dom, 229 1760). At the eastern end of Unter den Linden is Museum Island (Museuminsel), a UNESCO World Heritage Site whose clutch of superb collections includes the Pergamonmuseum. Berlin has over 170 museums and collections, making the city one of the world's prime locations for high-calibre historical collections of art, culture and technology, along with scientific collections. They offer everything from the ancient to the ultra-modern, such as the Egyptian Nefertiti, the Greek Pergamon Altar, the painters of the "Br?cke" and the "Bauhaus" and works by Baselitz and Beuys. The works found in the city's museums and collections and private galleries are interesting and diverse. The most visited is the Pergamon Museum, housing 3 collections: the Antiquity Collection, the Museum of the Near East and the Museum of Islamic Art. Charlottenburg Palace was a summer residence built in 1695-1699 by the Elector of Brandenburg, Frederick III, who in 1701 became the first Prussian King, and dedicated to his wife, Sophie Charlotte. Eastwards is Alexanderplatz, built in the communist era, and the TV Tower (Fernsehturm, 242 3333), a Berlin landmark, with a revolving observation deck; south are the reconstructed medieval Nikolaiviertel, and remnants of the original medieval wall. North of Alexanderplatz, the Scheunenviertel (Barn Quarter) is full of galleries, bars and shops. Its focus is the Hackesche H?fe, a maze of Jugendstil (art nouveau) courtyards of boutiques and cafes. Nearby Auguststrasse is the art scene?s main centre, and the Jewish Quarter revolves around the Neue Synagoge (New Synagogue). Prenzlauer Berg is a gentrified area with relatively few sights, more a place to go for a relaxed meal or drink. Friedrichshain, on the other hand, has a communist, post-industrial atmosphere. Online Berlin hotel reservation service representing directly over 100 central Berlin hotels offering special last minute deals, early bird discounts and in general excellent discounted rates. Book through email, secure service, telephone or fax through this website. Berlin hotels reservation server, a choice of more than 200 Berlin hotels from cheap to luxury. Here your can find and book any hotel in Berlin . For your convenience all hotels are sorted by alphabet, rates, class, and location. You can also find hotel by name.